Seaside - Residential area Mont Boron, near the Port and Old Town - For 2 people - Super luxury building " Les Oliviers du Mont Boron ", with enclosed parking, 1st floor, panoramic sea views, not overlooked, very quiet in park with pool, furnished accommodation 4 stars, southwest exposure. Renovated in 2012. 5 minutes from shops and beaches. 2 bus stops nearby. High speed wireless internet and HD bouquet fiber optic TV. All comfort: telephone, color TV, stereo, washer dryer, dishwasher, microwave, pyrolysis oven, induction hob, electric awning. Linen and towels provided. Double bed queen size in the bedroom. Sea view from every room and terrace. Cooling provided in summer by 2 large floor fans (1 in the living room and 1 in the bedroom), no air conditioner that is useless in this crossing and well ventilated apartment. Rates based on the chosen period and decreasing prices with the duration beyond a week (ask me for a customized quote). Charges are included in the price. Booking with secure payment possible (click on " Book Now" on the right). I rent this apartment for over 15 years and I invest regularly to keep the four stars that have been attributed to this tourist furnished accomodation (grading certificate available on request). As such, it is referenced by the Tourism Office of the City of Nice. I specify that I live in the same district which facilitates the reception and any possible help. 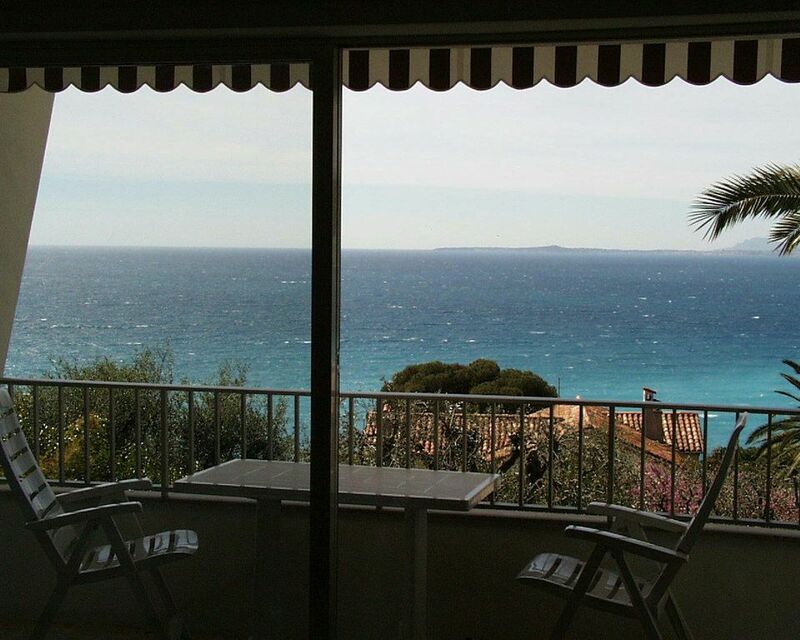 - It is in the most residential area of Nice, ' le Mont Boron ' (sea view, greenery and close to the town centre). It is near the sea (300m) and shops (300m). For indication, the Old Nice and the “Promenade des Anglais” are in 900 m and the Port or the supermarket CARREFOUR Market are in only 300 m. If need, 2 bus stops are in 100 m of the residence (bus n°30, 81 and 100). For instance, if you come by plane, you can take the bus n°98 in the airport then take the bus n° 81 or 30 at the place Garibaldi to arrive in the flat. If you want to visit the old town “le Vieux-Nice” or “le Marché aux Fleurs” (cours Saleya) near the “Promenade des Anglais”, you can take the bus n°30 or 81 from the flat. - It offers luxury services (classified 4 stars by the City hall of Nice) and a living space of 60 m2 / 645 sqft (include there a terrace). It is ideally directed, all the rooms and the terrace look out on to the sea (southwest orientation). - It has a beautiful sight panoramic sea on 180 °, the evening, the park is lit with in back - bottom the lights of the Walk. It is without opposite and is quiet. It is to note that the big bays glazed by the stay allow to take advantage of the sea view throughout the stay. - It can receive 2 people (bedding : 1 big bed 160x200 cm in the bedroom). - It was renovated in April 2012 and all the kitchen is new (pieces of furniture Schmidt, dishwasher, washing machine, tumble dryer, pyrolise oven, big fridge freezer, induction cooker, microwave oven, extractor fan, toaster, etc....). - It possesses a closed parking and an free access to high speed internet WIFI and to 160 TV channels including 30 in HD by the optical fiber (46' full hd led ultra slim television). - The cooling is provided in summer if necessary by 2 large floor fans (1 in the living room and 1 in the bedroom), no air conditioner in this apartment. - The swimming pool is belonging to the residence and is placed in the middle of the park with olive-trees and palm trees. Nice - so much more than just 'nice'! I booked Jean- Laurents apartment as our accommodation for our week in Nice after much researching on the internet. There's a lot to choose from in Nice & as we had never been we really didn't know where to base ourselves. Mont Boron is a lovely area - local supermarket & great pizzeria 10 mins walk away. The apartment is a good size. Lots of natural light. Spotlessly clean. Fully equipt. Pleasant decor. Good balcony with view over pool (also quiet & spotless) and beyond to the sea. It's about 20 mins walk to the port area & a couple of small local beaches are 10 mins walk. Buses to Nice are pretty frequent but it is also walkable. We couldn't have asked for more. J'adore Nice! I wouldn't hesitate to recommend the property, the area & Nice itself. Thank you for taking the time to write such a good review. It makes me feel great to know that I participated in making your holidays a good one ! It was great to meet you both and I hope to see you soon again ! The flat was very clean, with a lovely balcony overlooking the sea. Jean-Laurent explained how to use all the equipment in the flat and also told us how to get to the supermarket. As we had good weather all the week, the swimming pool was an added bonus. The buses to Menton, Antibes etc are very good and were not expensive . All in all, a lovey time was had by all. The owner is really nice, he made sure the apartment was perfect before we arrived. New kitchen, nice bathroom and lovely living room. The apartment was really comfortable, with nice sofas and the balcony, even though a bit small, but still comfortable with a great view. We spent most of our time there in the evenings. The flat is on a steep hill, so for the elderly maybe not so good, unless you drive. Buses into town are frequent and they all charge 1.50 euro, so really affordable. Direct buses also to Monte Carlo and Menton if needed. Villa Franchies in near by and with lovely little restaurants and bars, great sea and much less busy than Nice. Thank you Jean Laurant for looking after us so well. Very good alternative to a hotel. Description of the place was really good. The apartment was clean, especially the kitchen was brand new and perfect. We producet the meals themselves, as I have celiac disease. I will be happy to recommend the apartment to anyone. Nice was a very interesting city to spend our vacation. We do a lot of walking and had some good walking routes in the park Mont Boron and the beautiful gardens in Saint -Jean-Cap-Ferrat and in Cimiez. Thanks again to Ritva and Raimo for your delicious liqueur you brought me from Finland and for taking so much good care of my flat , I hope you appreciated the Pastis of Nice in returning home and I am also looking forward to receiving you again ! My wife and I have stayed in this apartment five times each for a four week period covering a part of January the remainder in February. Obviously we are very happy with the apartment and the owner. The apartment is very well equiped with every thing in excellent working condition. A recent upgrade was made to the living room and kitchen. The apartment is convenient for public transportation. For example, for 1 euro a person can catch a bus with stops in Nice center, Monaco, Menton and others. A car is not an absolute necessity but will require a willingness to walk up steep hills and staircases, however I recommend the use of a car.The apartment is up a steep curving hill but fortunately a reserved car parking space is provided with the apartment. There is a small Carafour market within walking distance but the area is very hilly which may limit an older person with a bad back, such as I. Thanks to Ralph and Ruth for your complete review and your loyalty, I hope your return to New York went well and I'm pleased and proud you choose my flat since so many years. I know you also appreciate a lot the sea view and the comfort in my apartment. Have a great week-end and see you next year !